McCabe dithers and looks forward, not back. The media stenographers and environmental sycophants must focus on what Murphy and McCabe actually do, not on the flowery rhetoric they spew. It is widely known that Gov. Christie was the worst environmental Governor in NJ’s modern history and his DEP Commissioner, “Culture Change” “Transformation” Corporate Cost Benefit Bully Bob Martin was unqualified and outright hostile to the Agency. But at least one person in NJ seems either to be unaware of those facts or incapable of dealing with them. Murphy DEP Commissioner McCabe has echoed the cowardly lack of accountability under the Obama” “Look forward, not backward” approach, a failure that ultimately enabled Trump to act with impunity (and not just on torture, CIA, and national security abuses, but on Wall Street accountability as well). Gov. Murphy’s DEP Commissioner Catherine “Candide” McCabe feels that DEP is moving in the right direction. McCabe was confirmed by the Senate on June 7, 2018 and issued a statement after being sworn into office my Gov. Murphy on June 19, 2018. It took almost 6 months for Murphy to get McCabe confirmed by the Senate, very likely after backroom concessions and deals with Senate President Sweeney. And Murphy was in no hurry to swear McCabe into office, waiting for 2 weeks after Senate confirmation to do so. Worse, by making no criticism or contrast, she effectively praised them and made further commitments to maintain continuity with them. So much for McCabe’s self declared “new era in environmental protection“. And I haven’t mentioned all the bad decisions McCabe has already made (like this and this and this and this and this and this and this and this and this and this and this). “The scope and diversity of this agency are truly amazing. We are already moving in the right direction in so many important areas. 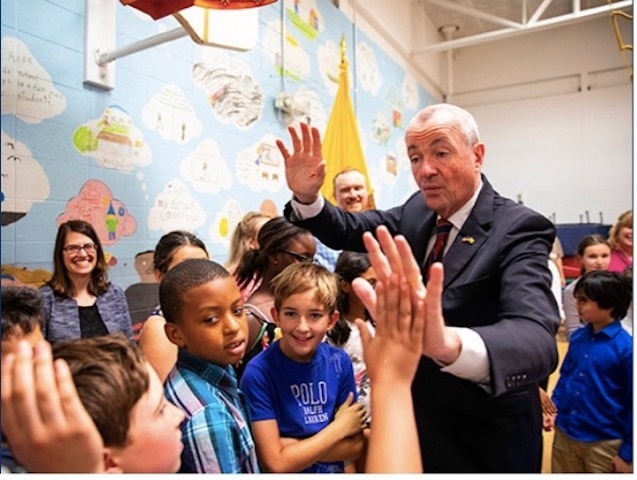 We are acting swiftly to address climate change by moving New Jersey towards a clean energy future and building our coastal resiliency, as well as taking strong steps to protect the quality of our air and drinking water. We are working hard to improve the quality of life in our cities through brownfield redevelopment and creation of urban parks. Contaminated sites are getting cleaned up thoroughly and in a timely manner. We are preserving ecologically fragile lands and wildlife habitats for future generations. And we are working smarter to conserve resources through innovative sustainability practices. How do I begin to dismantle that load of crap? Acting swiftly to address climate? How, by ongoing RGGI negotiations (for which they denied OPRA public records request – more to follow on that). Moving NJ to a clean energy future? How, by a billion dollar nuclear bailout, diversion of clean energy funds, and caps and other restrictions of expansion of renewable energy that threaten the solar industry and make it impossible to fulfill Gov. Murphy’s pledge of 100% renewables? Building coastal resiliency? How, by following Christie’s shore engineering practices and funding friendly ENGO’s and touting bad USACOE projects and conducting PR stunts? taking strong steps to protect the quality of our air and drinking water? How? Exactly how? By spinning the science? I see no attempts to reverse Christie clean water rollbacks i.e. the recent adoption of revisions to stream encroachment and wetlands regulations that apply to pipelines. Both rule proposals generated strong public opposition and the Legislature almost finally vetoed the stream encroachment proposal as inconsistent with legislative intent. And don’t forget that McCabe pledged to re-propose the Highlands septic rollback. quality of life in our cities through brownfield redevelopment and creation of urban parks? Say what? Only good news are temporary kills on insane Christie Liberty State Park development and Sparta Mountain logging projects. “Contaminated sites are getting cleaned up thoroughly and in a timely manner.”? WTF? Tell that to the people of Pompton Lakes who you lied to and betrayed. But considering the most important performance metric, after almost 6 months into her tenure, DEP has done NOTHING on the regulatory front. Nada. Zilch. No regulatory proposals at all. Look at DEP’s own website on “current rule proposals” to confirm that fact. 1. the Christie DEP, responding to Gov. Christie’s Executive Orders, had already postponed and re-opened 12 pending rule adoptions , revised the black bear hunting policy,and later killed a drinking water standard for perchlorate. The DEP is broken and needs to be fixed. We must and will make dramatic changes to how we fundamentally do business at the DEP. We need to make permitting and inspections timely and predictable. We need to play a key role in the economic growth of the state. All regulations need to be based on science, data, facts, and cost benefit analysis. Individuals and businesses coming to DEP for permits must be treated like customer (sic). Pursuing those “dramatic changes”, Martin them proceeded to abolish various DEP offices (climate change, especially), create new offices (economic review, especially) and replaced, transferred and reshuffled virtually the entire management team. He issued sweeping “Transformation” and “Culture Change” Orders and forced all DEP employees to attend “customer service training”. As I wrote at the time, Martin’s testimony is flat out false. Martin created a new policy of “by invitation only” “industry dominated Stakeholder meetings. Responding to Christie Executive Order #2, DEP fundamentally changed the process of developing and proposing regulations. Previously, DEP scientists developed rules and proposed them for public comment in the NJ Register. But under EO #2, Martin opened the door to industry lobbyists and lawyers to review DEP staff proposals BEFORE they were proposed for public review, enabling industry to kill rules in their crib. Christie slashed DEP budgets and in a huge brain drain, many longtime career employees left or retired – they were not replaced. With the sole exception of praising DEP experts, Murphy DEP Commissioner McCabe has endorsed ALL of this. She has not repaired any of the severe damage done by the Christie administration – in terms of regulatory policy, budget and DEP institutional integrity. McCabe has not repudiated the Martin “Transformation” “Culture Change” “Customer Service” or policy on “cost benefit analysis” and has retained the high level Offices of Economic Review and back door dispute resolution formed by Martin. She has not restored the DEP Office of Climate Change and elevated it back into the Commissioner’s Office and hired nationally recognized experts to lead the climate charge. Instead, McCabe dithers and looks forward, not back. 2. I was no fan of the Corzine DEP, but by this time in 2006, they were not where Murphy and McCabe are now. I am unable to document this conclusion right now because the DEP website does not go back that far in time and I don’t have access to the NJ Register and the time to do the research. 3. Although I am unable to document these facts right now because the DEP website does not go back that far in time, the McGreevey DEP had reversed Whitman policies, revamped DEP management team, opened up the DEP to public participation and liberal OPRA practices, and proposed major new regulatory initiatives and clean water programs by June 2002, including the C1 program, the phosphorus effluent standard, the Highlands and the failed Big Map. The media stenographers and environmental sycophants must focus on what Murphy and McCabe do, not on the flowery rhetoric they spew.